Avid bird watcher or not, Big Canoe’s 8,000 acres are home to some of Georgia’s most beautiful birds. Looking for an activity during a walk through the mountain trails and wildflower meadows? Keep count of how many Indigo Buntings you can spot. 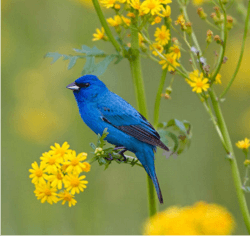 Indigo Buntings are exquisite blue birds and if you listen closely, you can hear them sing with cheerful gusto. Look for these brilliantly colored birds in weedy and bushy areas or sitting on the highest perch in a tree. Their electric blue color sets them apart from most birds so make sure you get to see them before their winter migration to warmer climates. It wouldn’t be a morning walk through Big Canoe without the majestic sighting of a Great Blue Heron. As this bird scans for prey they appear motionless which is easy to mistake as a statue. Within an instant, that is altered to a lightning-fast thrust of the neck and head as they stab their pray before meal time. The mountain trails and wildflower meadows are truly peaceful and majestic. They wouldn’t be what they are without the beautiful birds, especially the Indigo Bunting and the Great Blue Heron. Pack a lunch, have a picnic, and do a little bird watching!